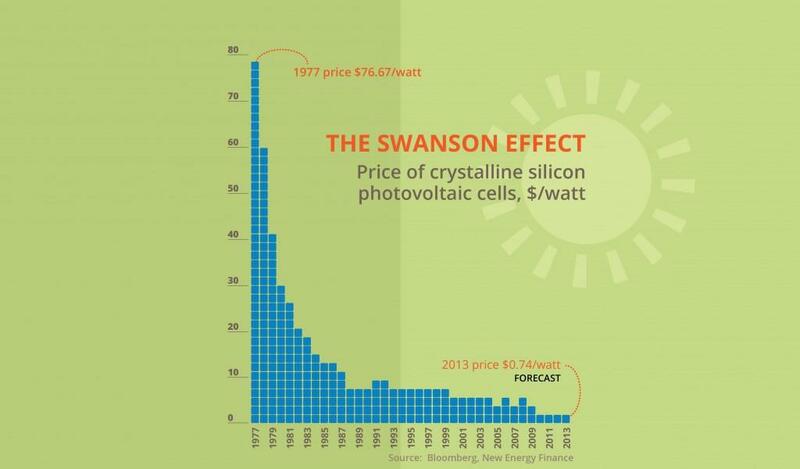 Costs of solar panels predictably drop by 20% every ten years, as outlined by The Swanson effect (see graph below), based on Swanson’s Law. Per watt rates have dropped to just $0.36 in 2014, compared to the 1977 per watt rates of $76.67 in 1977. Reduced solar panel expenses mean that the transition to solar power energy is more attainable for many individual residents but a 5kW solar panels system can still cost as much as $20,000. Financing the leap takes some planning and research, especially for anyone new to the concept of solar power. Each and every state in the United States has the authority to enact separate regulations and laws that apply to and impact the accessibility of solar power energy. We’ll take a look at some of those policies here along with three options for funding your solar energy system. 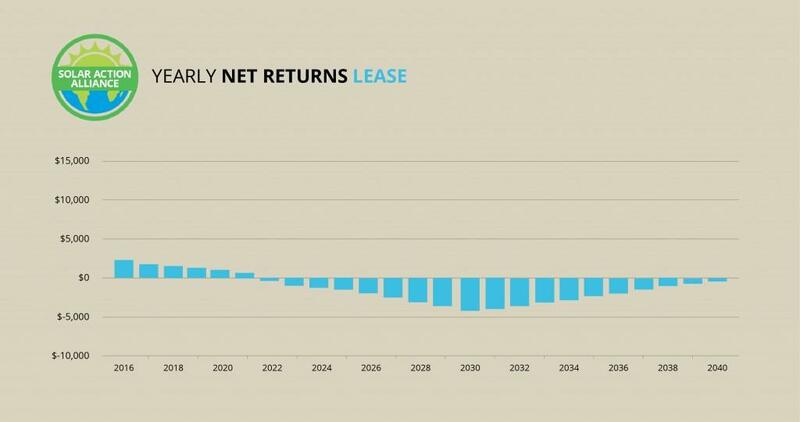 The return on investment over the 25-year warranty period of most solar energy systems is depicted in the graph above. Washington does not allow for leasing a solar panel system so financial options are limited to either a cash purchase or using a Home Equity Line of Credit (HELOC) loan to obtain your system. 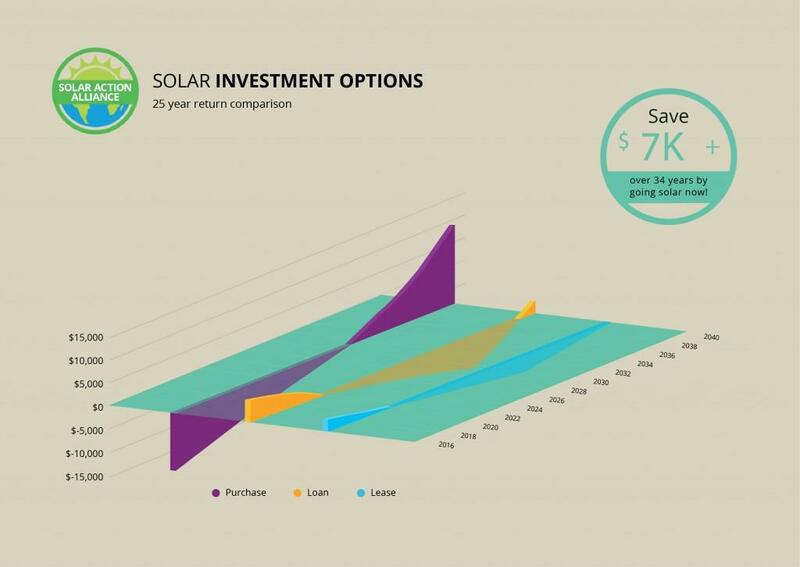 The green bars in the graph above demonstrate your return on investment for a cash purchase. It will take approximately 16 years to recoup the initial cost of a typical 5-kW solar system. By the end of the 25- year warranty of your system, you will pocket about $9,000 when you consider all energy savings, rebates and performance payments. But let’s see what kind of return on your investment you would get by taking out a HELOC to purchase your solar energy system. Right off the bat you are ahead because you use zero money from your pocket to purchase the system. At the end of the first year, you are entitled to a federal tax credit of up to 30% because you purchased the system even though you didn’t use your own money. 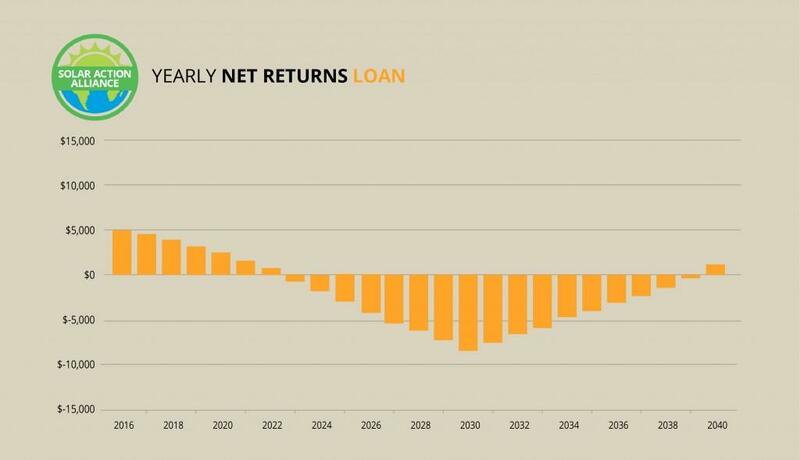 For the first seven years, those loan payments will actually be more than what you save in energy bills and after the loan is paid back in year 15, the savings flow in. After a twenty-five-year period, you basically level out even on your investment. Every year after that your savings go into your pocket. If you are enthusiastic about the concept of solar power energy but don’t have cash on hand or much equity in your home, your third option is to use a HELOC to purchase a 2-kW system instead. The amount of the loan needed is much smaller, but you get to help the planet by lowering the CO2 you generate, and over time you still end up breaking even. Focus on the graph above which depicts what happens if you use a HELOC to purchase a smaller 2-kW solar power system for your home. Although not as lucrative as a cash purchase, it is a feasible option for many people. The price of this smaller system is approximately $8,400 to purchase and install. Your HELOC payments annually will be $797 but you will save $190 the first year on your electricity costs. So you’ve paid $607 that first year but in Washington you are entitled to recoup $0.15/kWh in payment or $316 for the year. After you take advantage of the tax credit of 30% on your federal tax return, you end the first year with $2,229 in your pocket. For the following years, the payments on your loan will actually be $24 more than your savings in electricity. But starting in year 15, your loan is paid for and you see $300 or more in savings for as long as your home solar panel system is operating. Ok so let’s say you are one of those hardworking folks that has been able to amass enough savings to purchase a solar system with cash. You will need about $18,750 for a 5-kW solar panel system. That’s a hefty up-front investment but not so bad when you look at how the numbers break down. At the end of your first year you are eligible for that 30% tax credit on your federal return because you purchased the system. That’s $5,625 on top of your energy savings in that first year of about $474. That brings your first year cost down to just $12,651. Now in Washington, they actually have pretty decent performance payments, they pay you to make clean energy. The lowest payment is $0.15/kWh for a minimum of $790 more in your pocket, making that first year total only $11,861. Between the performance payments and the money saved on your electric bill, that’s about $800 annually as long as your system is operating. 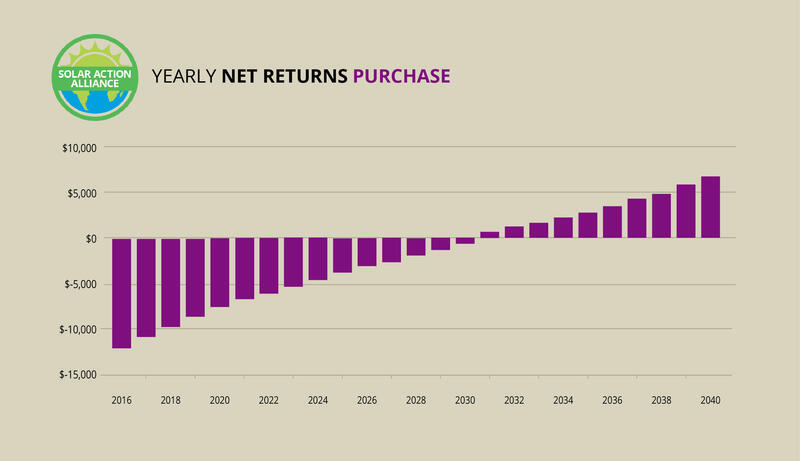 Over a 25-year period you reap an estimated $8,885 in profit which is a 5.2% internal rate of return. That’s a fairly stable investment considering the value of your home jumps up by $9,477 due to your estimated savings in electricity and you also help the planet by using clean energy. Typically using a HELOC to purchase your 5kW solar power system is a pretty clear decision. Unfortunately, in Washington, electricity rates are fairly low and so even though the state does offer some good incentives, you basically come out even over a 25-year period. This doesn’t mean that using a HELOC to purchase your solar panels isn’t worthwhile, it just means you need to do some homework to make sure it’s the right option for you. So if you look at the graph above, you will see a big plus for you at the start, because using a HELOC for your purchase means zero money down for you up front and at the close of that first year you also get to take advantage of the federal tax credit of 30%. That puts you $5,109 ahead after year one. Even though your loan payment amount will be higher than your electricity savings for the next 14 years, it evens out once that loan is paid off. So paying on your HELOC for 15 years, you’ve spent about $8,400 out of your pocket. Now you get all the electricity savings though and have no payments for the remainder of your solar system’s mechanical lifetime. With an expected annual increase of 3.5% in energy costs, you finish the 25-year period with $946 in your pocket on top of the $5,000 you saved in year one. 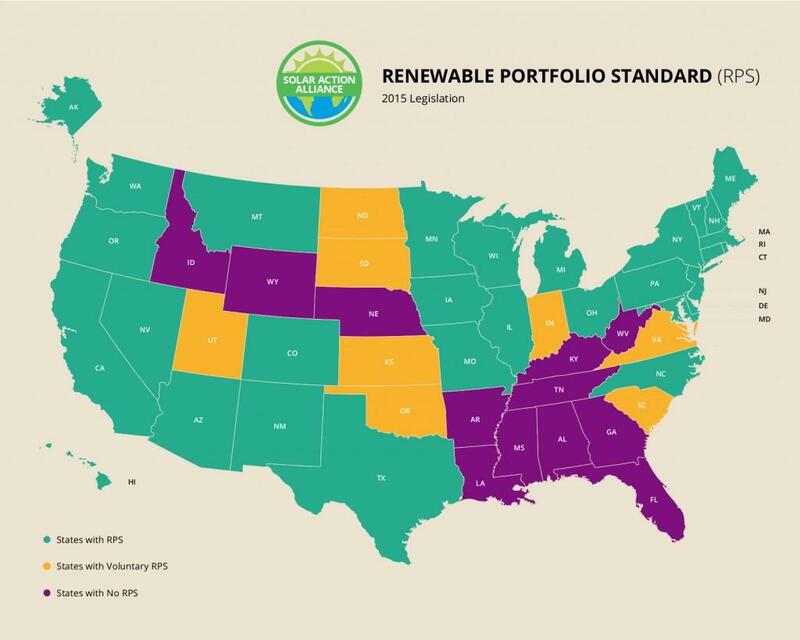 In many states, the legislature requires that a specific amount of all power produced comes from clean, renewable energy sources by a specific target date, called an RPS or Renewable Portfolio Standard. Utility companies are obligated to meet these targets either by producing clean energy themselves or by purchasing from the solar systems of its customers. There are strict penalty fees in place for failure to meet the targets and avoiding those high fees serves to motivate utility companies to offer programs that encourage residents to make the transition to solar panel power. Washington passed its RPS in 2006, right on the heels of Colorado who was first in the country to set an RPS. Washington mandated a 3-phase program that required 3% of all power be from renewable sources by 2012, then 9% by 2016, with a final target of 15% by 2020. While Washington hit the ground running early with its RPS mandate, the 15% target is at the bottom of the range when compared to some other states. Washington state is tied at 25th with an overall C grade on the 2016 solar report card. Washington is rated most poorly in the areas of solar carve out and property tax exemption, it has neither and so gets an F in these categories. It does have a state mandated RPS target, though it’s on the low side and there are some tax credits so these categories get a C grade. 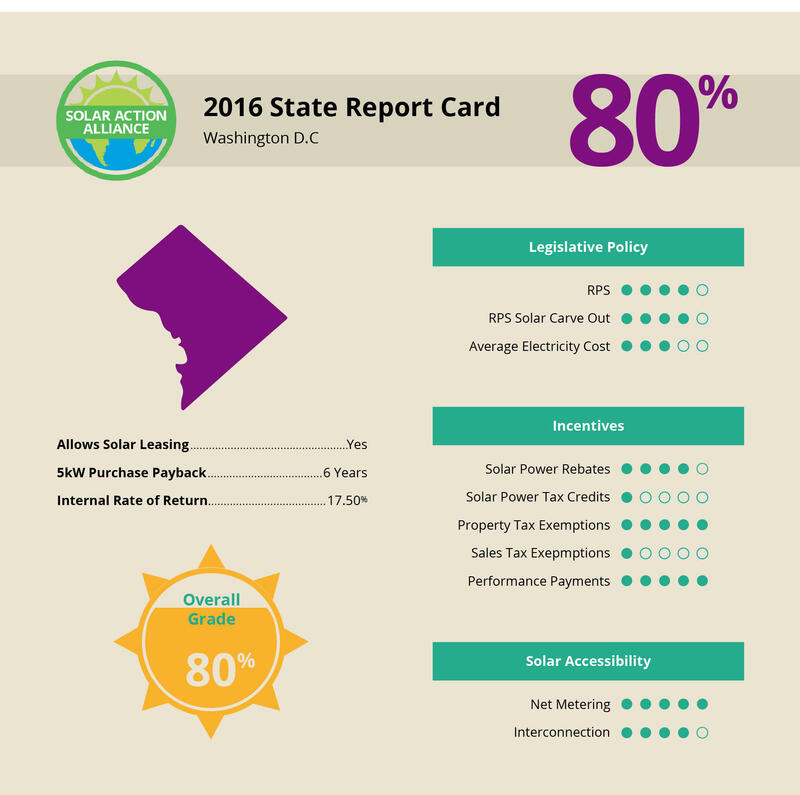 Washington scores the best for its performance payments and sales tax exemptions, earning A’s in both categories and gets a B grade for its net metering and Interconnection policies. The real damage is done because Washington takes advantage of all its water resources to lower electricity costs, which is good news for electric utility customers but if you want to go solar there isn’t much room for savings on energy bills. For residents of Snohomish County, third largest in Washington, there is a rebate on solar panel installation costs that caps at $2,000. So there is hope for Washington residents who want to go solar because the state does have a mandated RPS and does have some other incentives that make the investment worthwhile. It will currently take approximately 16 years to recoup the money for your initial purchase, an internal rate of 5.2% return on your investment.